New Delhi: Imagine working in an office that uses sunlight instead of artificial lights for illumination and that has in place central air conditioning instead of the split or window air conditioners. In an increasing revolt against over-urbanization, companies are opting for eco-friendly options. The concept of environment-friendly buildings, or green buildings as they are popularly known, is catching on in India. While the green building movement has been around globally since the 1970s, it has picked up momentum in India only in the last couple of years. Green buildings are steadily increasing their footprint in India with an increase from 6,000 sq. m of green space in 2003 to 304,800 sq. m expected by the end of 2008, according to the Indian Green Building Council, which is promoting the green building movement in India. The first green building in India was the CII-Sohrabji Godrej Green Business Centre in Hyderabad. Kolkata’s Technopolis lays claim to be the country’s first green building for information technology. A mix of green building projects is coming up in the country, which includes residential, commercial and hotel properties. As cities get hemmed in by concrete buildings and green spaces rapidly disappear, companies are looking at green buildings to do their bit for the environment. In turn, some of them can earn carbon credits for the clean buildings. “Corporates feel that they are fulfilling corporate social responsibility by opting to make their buildings eco-friendly," says Varun Pahwa, assistant vice-president of Desiccant Rotors International Pvt. Ltd, which supplies green building materials. “Also, as green buildings use less power and water, the cost of running the building is less." There are other ways in which such buildings pay off. Technopolis, for example, makes money through trading carbon credits—about Rs75 lakh a year. Technopolis is also the first green building in the world to be registered under the United Nations Framework Convention on Climate Change as a clean development mechanism project. The clean development mechanism allows companies to obtain carbon credits for initiating projects that reduce carbon dioxide emissions while enhancing sustainable development in countries. The concept of carbon credit trading seeks to encourage countries to reduce their greenhouse gas emissions, as it rewards those countries which meet their targets and provides financial incentives to others to do so as quickly as possible. Surplus credits (collected by overshooting the emission reduction target) can be sold in the global market. One credit is equivalent to one tonne of carbon dioxide emission reduced. There are also other benefits to be had. For instance, real estate developers also find it advantageous to construct green buildings as they can then charge a higher rate for such buildings. “Green buildings cost between 4% and 10% more than the normal buildings," says Pahwa. 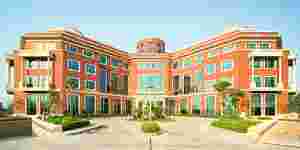 Spectral has designed energy and lighting systems for Wipro Technologies’ development centre and the ITC Centre, both in the New Delhi suburb of Gurgaon. However, the bulk of the commercial and residential buildings in India are still non-green. In fact, some of the sprawling suburbs of New Delhi and Mumbai have come in for sharp criticism for the hundreds of ordinary glass-fronted structures, which let in heat and consequently use up more energy in cooling the interiors. This, despite the fact that summer is the country’s dominant season. Still, according to Pahwa, there are around 100 green buildings in India in cities such as New Delhi, Chennai, Hyderabad and Kolkata. Green buildings can save as much as 30% on power consumption every year compared with normal buildings. “We use a special glass which reflects sunlight better," said Prem C. Jain, chairman and managing director of Spectral Services Consultants Pvt. Ltd, a consulting firm that designs lights and heating for green buildings. “We work with sunlight during the daytime, which results in a lot of saving on power." Spectral uses very little artificial lights in the buildings it designs. These buildings also use 40% less potable water and water is conserved through a zero-discharge system under which the entire effluent is treated in a sewage treatment plant and this water is recycled for air conditioning and other purposes. Green buildings are also environment-friendly because they are built of materials that are good for the environment. “We use aerated concrete blocks instead of bricks," Jain said. “This provides good insulation." Such buildings are also getting fashionable as polluted cities bring in more respiratory diseases and germs that travel through stale air and air-conditioning ducts. However, not all green buildings are equal. They are scored by rating systems, such as the Leadership in Energy and Environmental Design rating system developed by the US Green Building Council. The council rates buildings as silver, gold or platinum based on certain parameters such as water and energy efficiency. In India, Hyderabad’s Green Business Centre, Wipro Technologies’ office and the ITC Centre have been certified as platinum-rated green buildings by the US Green Building Council. The Green Business Centre was the first building to get a platinum rating in the country, and was in fact the third in the world to achieve this rating. However, there is still a scarcity of green building materials and equipment—and their suppliers—in India. The Indian Green Building Council estimates the demand for green building materials and equipment will reach $4 billion (Rs15,720 crore) every year by 2010. Some environment-friendly building materials such as fly-ash cement, recycled aluminium, steel and tiles are available in India, but for more specialized goods, imports are the answer.